My wish of seeing the Saguaro blooms has been granted, even though with Steve’s situation it’s under less-than-desirable circumstances. But we’re enjoying this opportunity as our consolation for being in Tucson this time of the year. 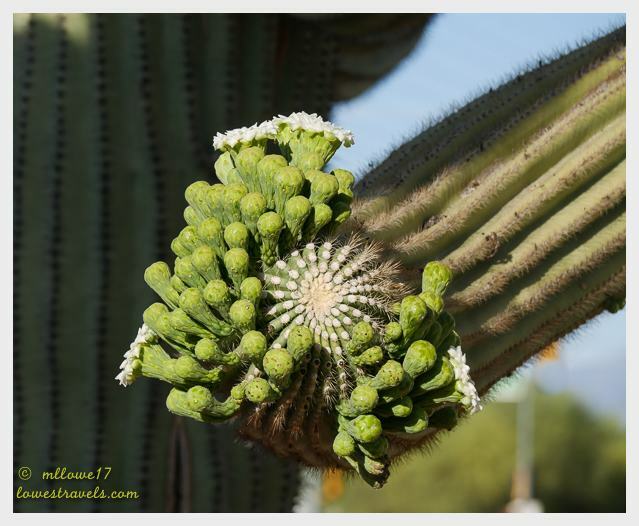 The best way to view the white Saguaro bouquets was to revisit Saguaro National Park. Driving there was also a step forward for Steve, as it was his first outing following surgery when he wasn’t feeling like a zombie from all the drugs. 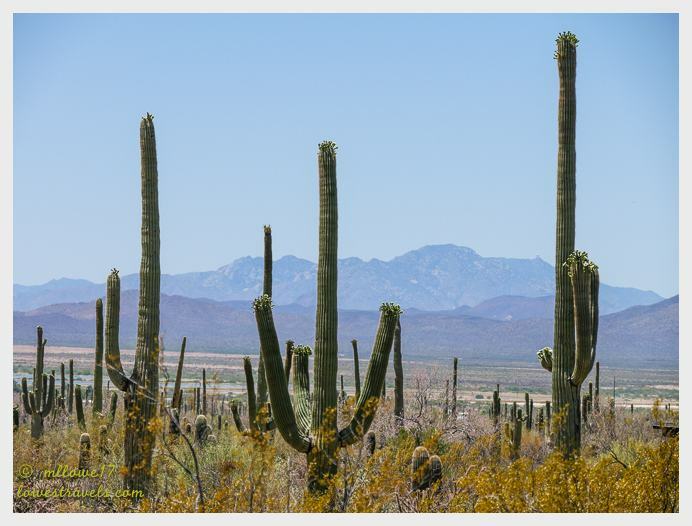 It’s said that the indicator plant of the Sonoran Desert is the majestic Saguaro cactus, the icon of the southwest. During late April thru June, as other desert wildflowers have done their thing and wilted, the superstars of the desert awaken to fill the landscape with blooms at the ends of their arms, like a bouquet of white flowers. In our past visits here, these tall green giants seemed to stand patiently awaiting their turn to show off. The time has finally arrived and we are glad to be here to admire the explosion of floral beauty. Surprisingly, the Saguaro flower is a short-lived beauty; it opens after sunset and by the next early afternoon the blossom wilts. 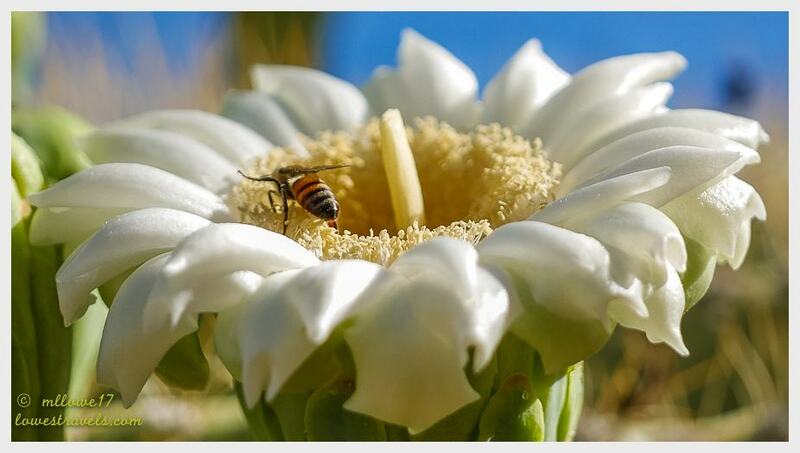 Despite this short time period, the flower attracts an array of pollinators. 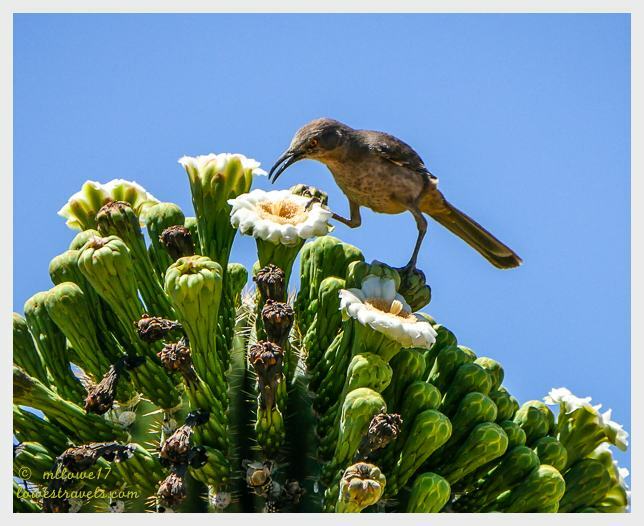 During the night they’re pollinated by the Mexican long-tongued bat and the lesser long-nosed bat, while daytime hours bring the birds and bees to a feast as they continue the pollination process. 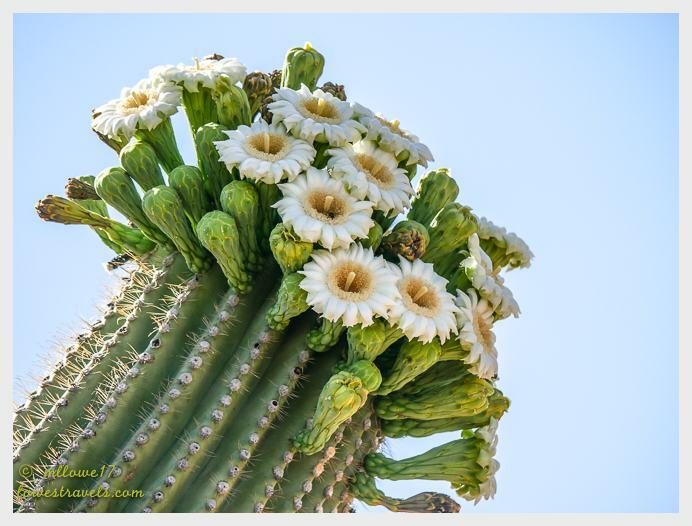 The Saguaro flower clusters don’t all bloom at the same time on the plant; the blooming cycle of a single Saguaro can last up to 6 weeks before all of the flowers have opened and closed for the last time. The road leading to Steve’s doctor’s offices are lined with Saguaros, so for several weeks we got to see the progression of the blooms each time we drove by. 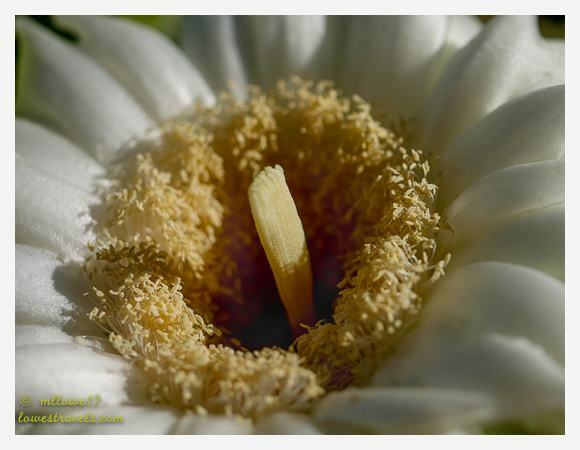 Getting up close and personal, I discovered the flowers are trumpet-shaped with silky white petals, each containing hundreds of golden stamens. The flowers are suppose to emit a strong smell, sort of like overripe melons but then I am vertically challenged to reach them so I could not confirm that. Seeing the Saguaro flowers is a tick off from my “must-see” list and I’m really happy with that. 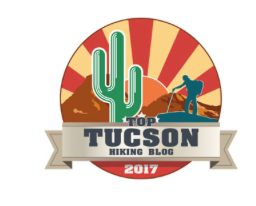 The drive to Saguaro National Park – East and West – signaled one of the first breakthroughs for Steve. Since his hospital discharge the focus had been to fatten him up and reverse his weight loss. It would have been an easy task if not for the terrible pain he had when swallowing. As time went on he was able to slowly progress from a liquid diet through soft foods, and then onto “real foods” in four weeks. His speech impediment has lessened and his energy level remains high, as he has to actually reduce his daily walking routine so he won’t walk off all the weight we’re trying to put on him! Head and throat pains linger, and Tylenol is his friend. In order to distract from nagging pain he works on simple repairs. Serious hiking is still a ways off, but we walk around the RV park and in the area several times every day. As for me, our daily walks meet my 10,000 steps goal which is wonderful! His next phase is radiation therapy, beginning on June 6th. Just as he’s gained weight and is feeling better, he’ll soon be back to square one for a while. We know we’ll get through it, taking one day at a time as we’ve been doing. The saguaro bloom has been one of my favorites since I first moved to AZ back in the late 70’s. I’m so glad to hear that Steve is steadily improving. You are both in our thoughts and prayers. A wonderful photo of two partners in sync….sending you good thoughts from Kentucky! Wonderful picture of you both (glad to hear that Steve is doing better!). Somehow, I had no idea saguaro had blloms like that. Thanks for taking the beautidul photos. You may be vertically challenged ML, but you certainly got good shots looking down on the flowers! Beautiful pics of the desert in bloom. 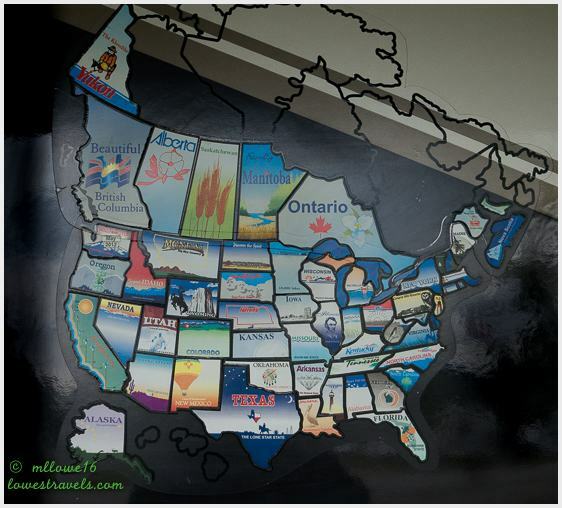 We look forward to being there to see it someday as well. Hoping Steve has a smooth and complete recovery! We have never been in that area when the Saguaros are blooming, absolutely beautiful. One day at a time is the only way, hang in there! I just love that picture of the both of you. It really does take a team to fight cancer. 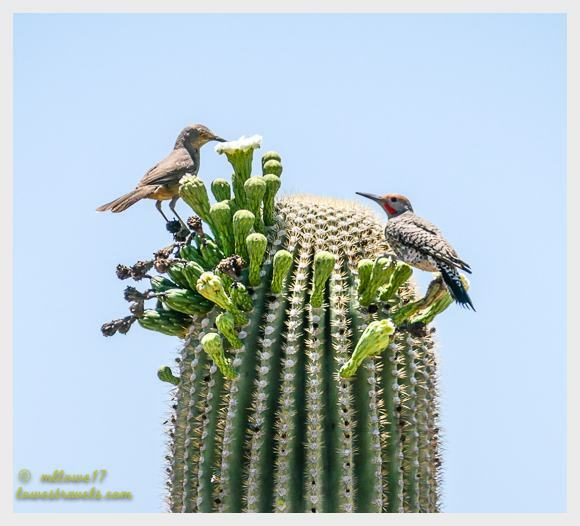 So glad you got to see the Saguaros blooming and for sharing them with me. What a thrill. Not sure we’ll ever be able to get west again since David’s treatment specialist is in Florida, although we’ll sure try to. That’s what you have to do, find all the things to be grateful for in the midst of this life altering situation. We have you in our thoughts and send wishes for continued strength to you both. Love those blooms! I’ve just seen a few at a time, but they are gorgeous! Yay for Steve bouncing back! Good luck to him on future treatments. Good thoughts always going his way! 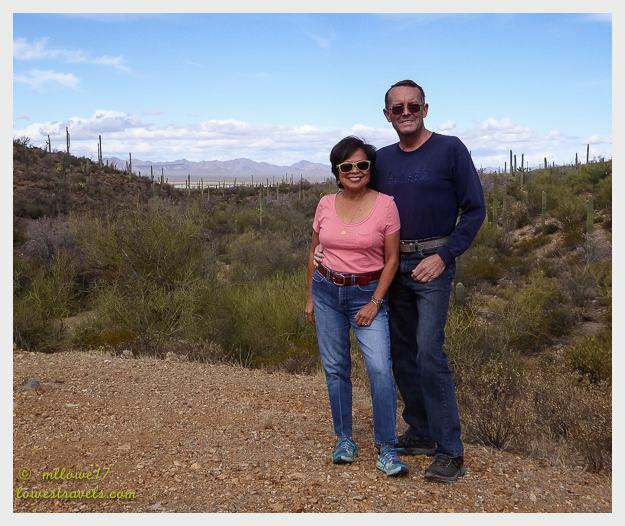 MonaLiza and Steve, Great job getting out and seeing the saguaro blossoms. Being outside in nature should help both of you feel better. Congratulations to Steve for getting through the first round! 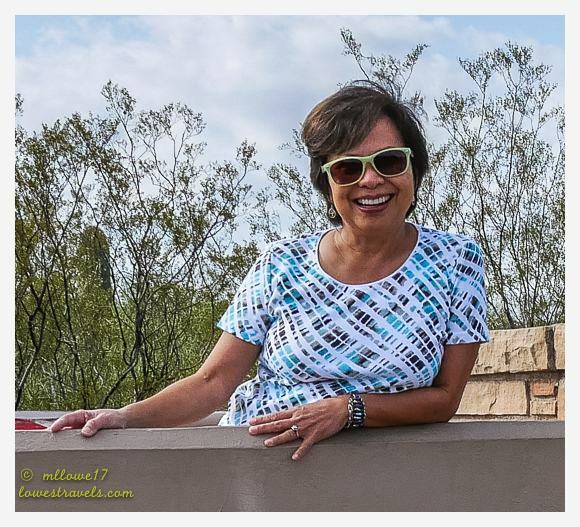 Thanks for the update on Steve, and the lovely saguaro photos. Great photo of you guys! Glad to hear things are improving and progress is being made. Just gotta keep taking things one day at a time. 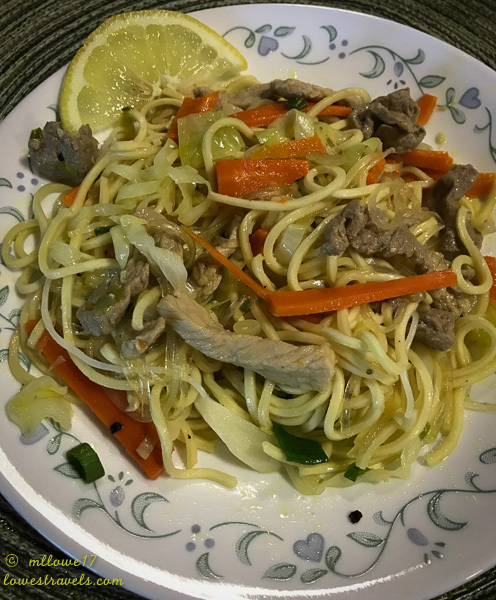 And that pancit looks fantastic!! You both look awesome. Hugs and prayers. The magnificent Saguaro and their blooms are amazing. So happy you saw them up close and personal and sent them our way to enjoy. What a beautiful post about the Sarguros, pictures of them and the nice picture of you and Steve. Glad to hear Steve has been making great progress. Hopefully, the radiation will not set him back, I don’t think it is nearly as hard on the body as chemo. You are both in my thoughts and prayers each and everyday. Stay strong and positive, this will all be over in a few months and you will be onto your next adventure. 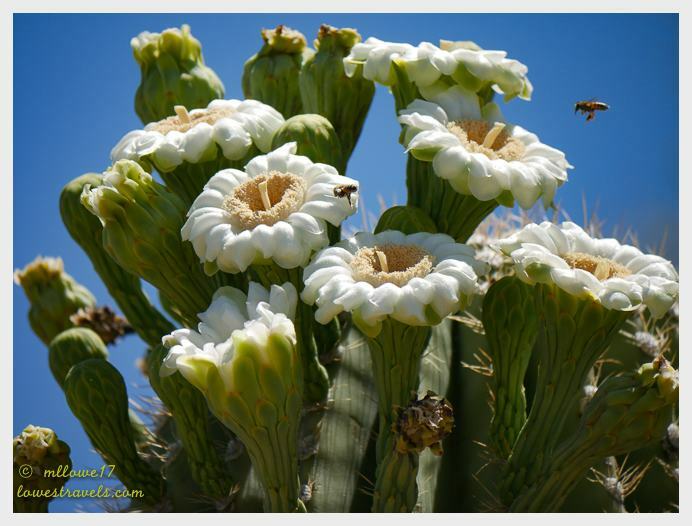 Lovely shots of the saguaro flowers! A bright spot in an otherwise dismal spring/summer. Wishing Steve all the best as he goes through his various treatments and continues to recover. 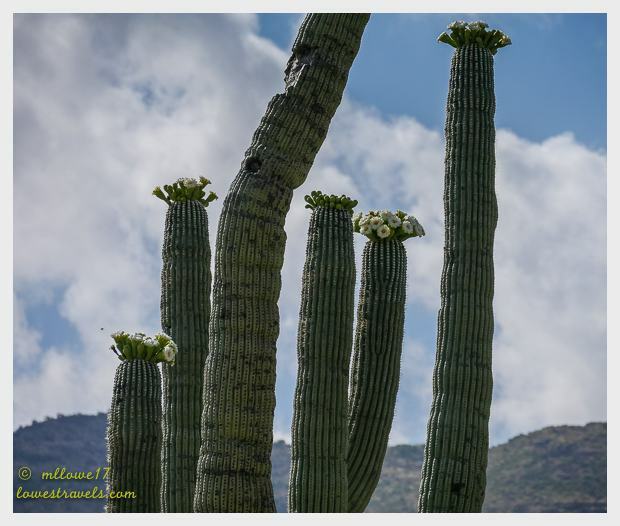 Amazing photo’s of the Saguaros, thanks for sharing. We are glad to hear Steve is starting to feel better 😊 Our prayers are with you during this next stage.